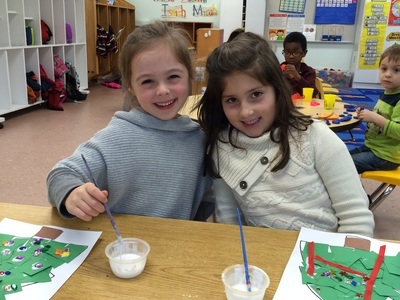 Our Pre-K and Kindergarten program seeks to engage students with hands-on, meaningful learning experiences through small group instruction, learning centers, music, crafts, games, physical education activities, and play. We primarily use A Beka Book materials for our core phonics and math curriculum across the K3-K5 levels. Science and Social Studies enrich our program as we study seasonal topics and holidays through children's books and literature. Bible stories for all levels are taught starting at Genesis and progressing through the Old and New Testaments. In our Pre-K program for three and four year olds students primarily attend Tuesdays and Thursdays, with the option of half or whole days. (They are welcome to attend more days depending on availability. 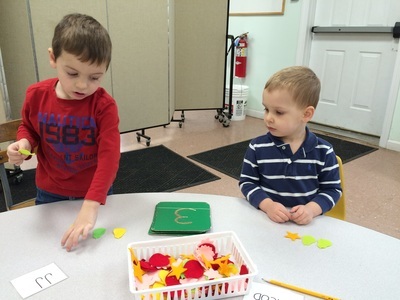 )Their curriculum covers letter sounds, recognition of consonants, and short vowels. They are introduced to tracing letters and begin reading short vowel words in our K4 reader program. During math we introduce numbers 1-20, practice counting and begin number formation. Additionally we practice and review shapes, colors, and writing one's name. The K5 Program builds on skills previously learned from the K3-K4 program. 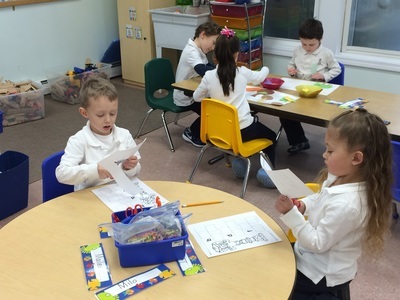 K5 Kindergarten students primarily attend Monday, Wednesday, and Friday, with the option of half or whole days. (They are welcome to attend more days depending on availability.) The five year olds are introduced to consonant sounds and short and long vowel sounds. As a result, they are able to learn to read short and long vowel words, simple sentences and stories through the “Basic Phonic’s Readers” by A Beka. Additionally our program focuses on letter formation, handwriting, and writing simple stories. During math, we count to 100 by one’s, ten’s, and five’s. Other areas covered are addition facts through ten, value of coins, telling time, using the calendar, days of the week, and beginning subtraction. K5 is grouped with 1st and 2nd grade on Monday, Wednesday, and Friday afternoons for science and social studies. Special times of learning take place during Thanksgiving, Christmas, and Easter.